Ask anyone in South America where the best place for food is on the continent and most will say Peru, even the Chileans! 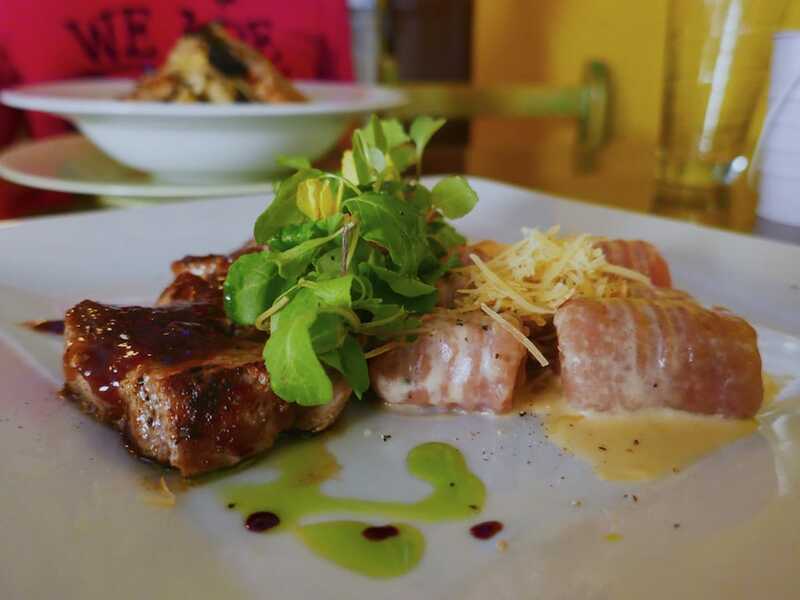 Lima is particularly famous for being the beating heart of the culinary scene because of the many different fusion foods, including influences from Japan, Africa and China. As a result, there are many highly rated restaurants in the city, including three from The World's 50 Best Restaurants for 2016: Central in 4th place, Maido in 13th and Astrid y Gastón in 30th. If that's not enough, according to the World Travel Awards, Peru was voted the World's Leading Culinary Destination for 2016, and has won the award every year since 2012 (Stefan was quick to tease our proud Frenchman about this). 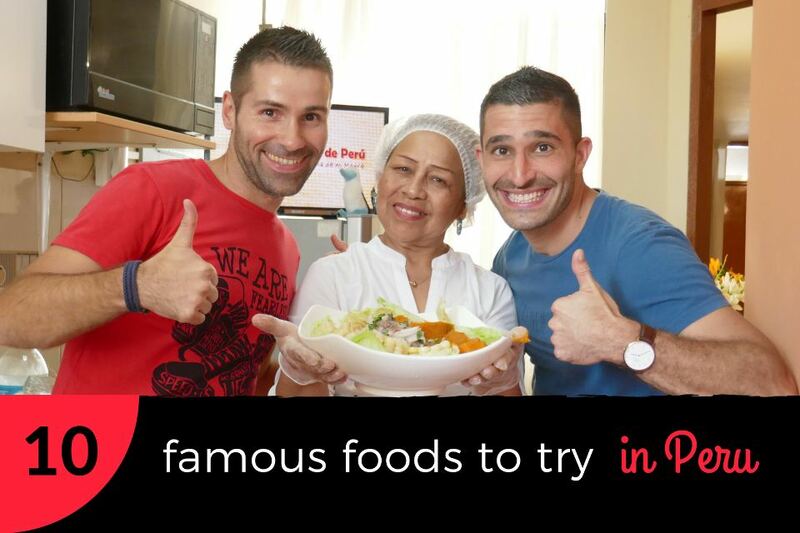 This is a summary of our 10 famous foods you must try in Peru following our culinary journey through this foodie paradise. Everyone knows and loves ceviche: the signature Peruvian salad of raw fish cooked in the lime juice and spices it's served with. The mix of the fish/lime marinade is called Leche de Tigre, which means Milk of the Tiger. This fishy tiger milk is also considered an aphrodisiac – the Peruvian blue pill. Yup you read right: according to legend, if you have trouble getting your groove on, just get a few ceviches down you and you're sorted for the night! Pisco Sour is the national drink of Peru and one of our all time favourite cocktails. It’s a mix of Pisco (a grape brandy), lime juice, egg whites and syrup. It was invented in the early 1920s at Morris Bar in Lima by its owner, Victor Vaughen Morris who came up with the idea of adding Angostura bitters and egg whites to Pisco. Morris Bar closed in 1929 after Victor passed away, but his legacy lives on. 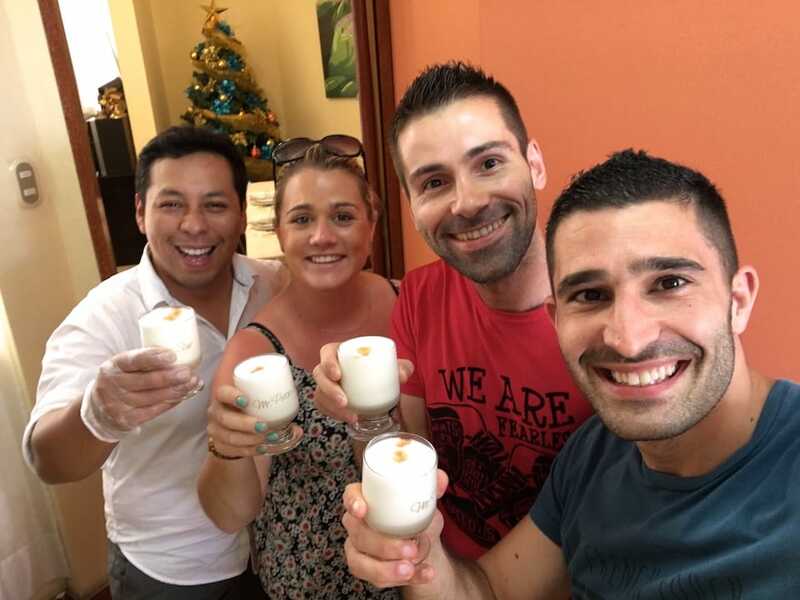 Since 2003, his famous cocktail invention got its own official national holiday: the Día Nacional del Pisco Sour (National Pisco Sour Day) which is celebrated on the first Saturday of February. 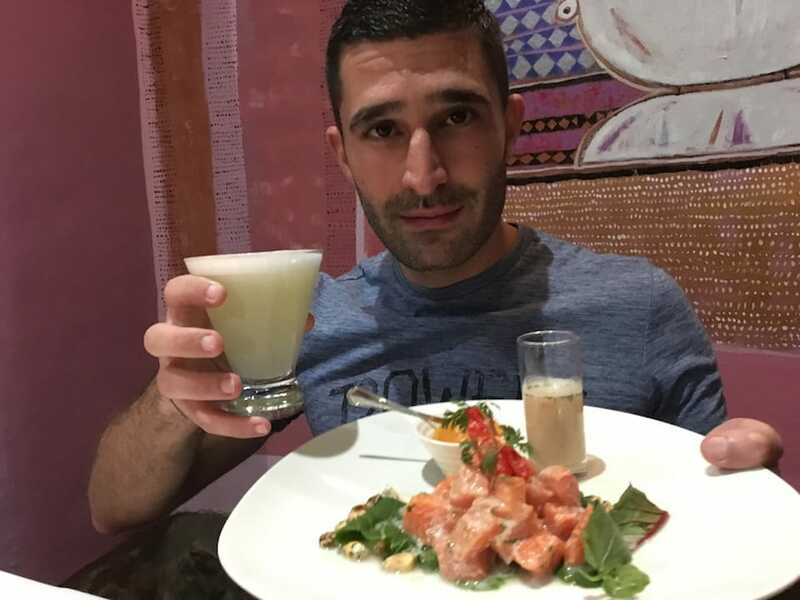 You can try out our recipe for Pisco Sour, courtesy of our friend Aaron from Lima, nicknamed Mr Pisco Sour. Alpacas and llamas are ubiquitous throughout the country. Llamas are like the Peruvian horses, used to carry things from A to B. They stand proud, like camels with beautiful bulging Bambi-like eyes. Alpacas on the other hand are smaller, more fluffy and are mainly bred for their wool and meat production. Alpaca is a lean meat which tastes like veal. They were first reared by the Incas who domesticated them over 6,000 years ago. 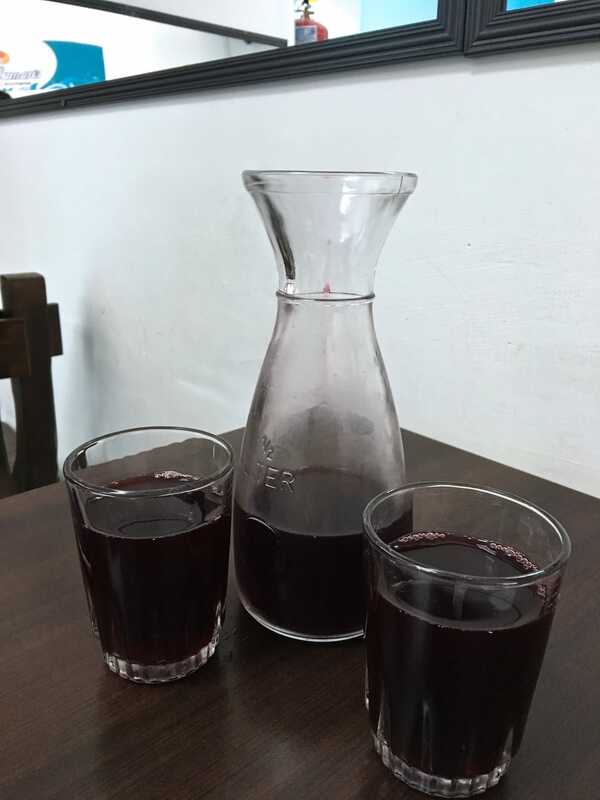 Chicha morada is a sweet non-alcoholic Peruvian beverage made from boiling the corn with pineapple, cinnamon, clove, and sugar. When not ordering Pisco Sours, chicha morada was our favourite drink of choice to accompany our meals. This simple vegetable based drink which originates from the Incas is extremely healthy: as well as an antioxidant, it boosts your immune system, helps reduce cholesterol and blood sugar levels. The Peruvian cuisine has been strongly influenced by the waves of immigration from China. Peru has the largest ethnic Chinese community in Latin America, with a particular large El Barrio Chino (china town) in Central Lima. Go to any local market in Lima at lunch time, you will find that one of the most popular (and very yummy) dishes offered everywhere alongside ceviche is chaufa de mariscos. 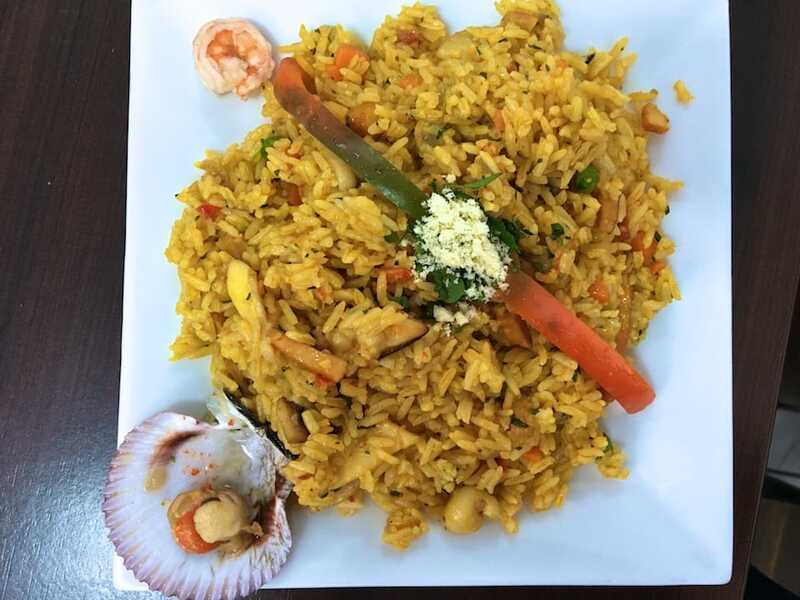 This is a mix of these two cultures: Chinese fried rice with sea food, mixed with Peruvian spices like chili peppers. Tacu tacu is a popular Afro-Peruvian dish, which originated as a way to use up left overs. The name originates from the Quechua word takuy, which means to mix one thing with the other. A common tacu tacu consists of left over beans and rice, spiced with hot pepper and garlic, served with pork, beef, or an egg, along with slices of fried plantain. It is usually formed into a patty and then fried. Lima beans, lentils or chickpeas can also be added. 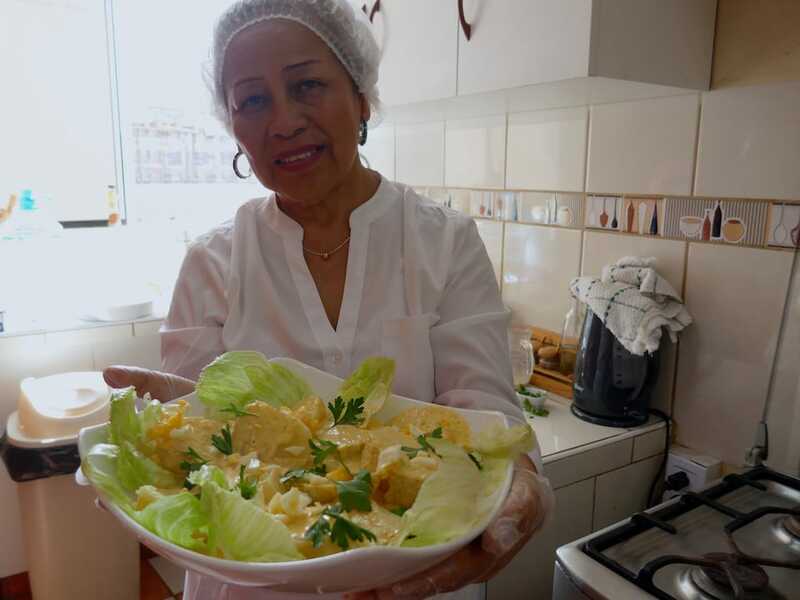 One day in 1974, a retired mother of 7 children called Rosalia Elena Soler from Ica in South Peru, started making desserts to fill the hours of her golden years. One of her most popular treats consisted of pecans mixed with thick dulce de leche (slowly cooked condensed milk), covered with white fondant and chocolate. These became so popular, she started selling them. 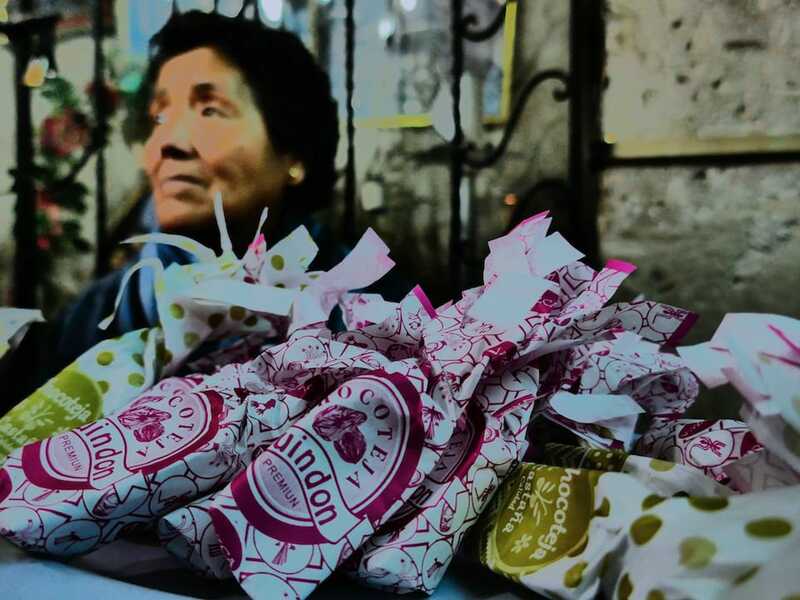 Over the years, a new Peruvian confectionary was born: the chocoteja. You can find them sold in markets across South Peru, particularly in Ica and Arequipa. Anticucho is a popular and inexpensive street food, which originated in the Andes during the Inca empire. 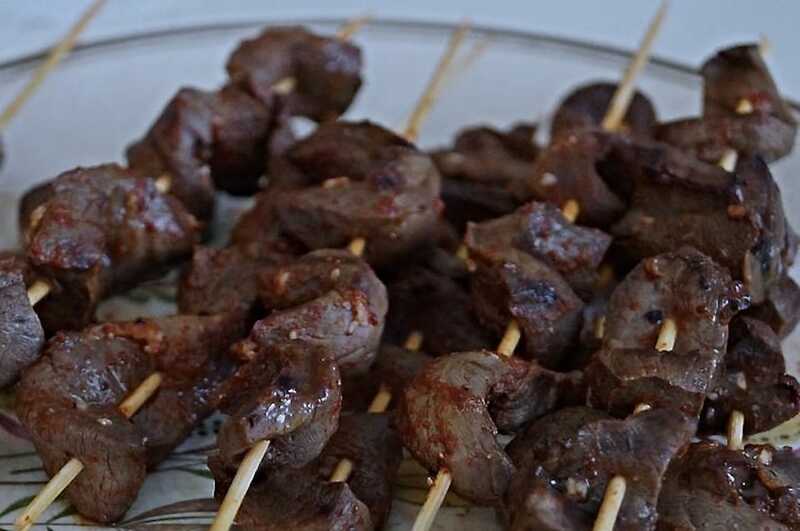 It is a skewered meat dish, traditionally made with cows' hearts. The meat is first marinated in a mix of vinegar with spices like cumin, ají pepper and garlic. It is then grilled on a barbecue. It's actually far tastier than it sounds. We suggest you give it a try before you dismiss it. It has a chewy texture and tastes a little bit like liver. Anticuchos are especially popular during the many barbecues which take place in July to celebrate Fiestas Patrias, the Peruvian Independence Day. 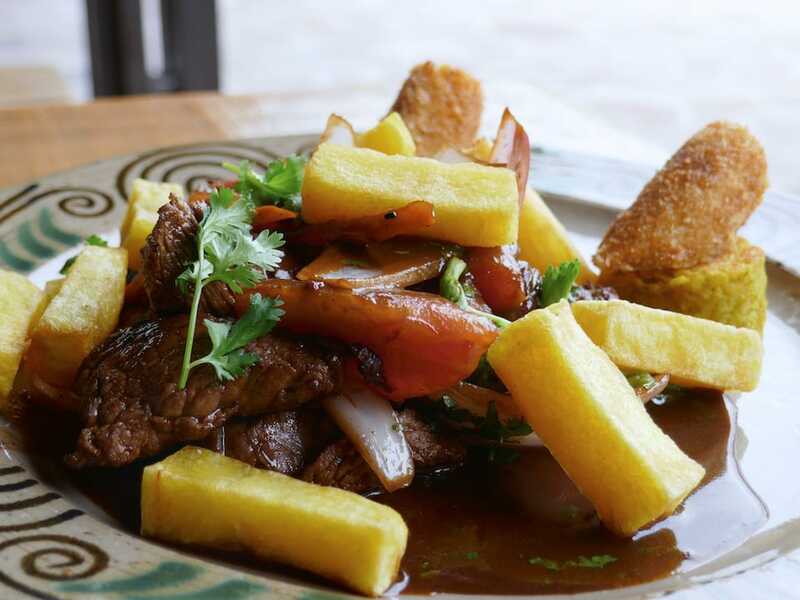 Llomo saltado is one of Peru's most loved dishes. It is a stir fry of beef with onions, tomatoes, served with chips and rice. Llomo means pork loin and saltado means stir fry. 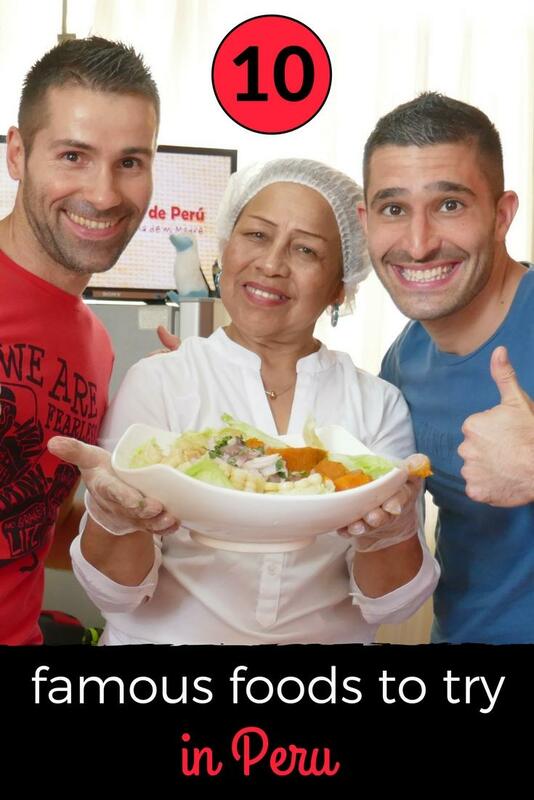 This is another Chifa influence in the Peruvian cuisine. Chifa is the word used in restaurants to describe Peruvian-Chinese fusion food. It comes from the Chinese word chi-fan, which means eat rice. Our chips loving Frenchman was especially pleased at the addition of French fries to the many llomo saltados he devoured in Peru. Papa a la Huancaína is a Peruvian appetiser of boiled yellow potatoes in a spicy, creamy sauce called Huancaína. The name originates from Huancayo, a city in the Peruvian highlands, around 300km East from Lima. It is served as a starter over lettuce leaves, garnished with corn and a hard boiled egg. I saw that Chinese Fusion stuff all over Cusco and Lima Guys. Now I know what Chifa means LOL. Looked really good but I stuck with more local fare when I was there. Amazing food in Peru. I always enjoyed seeing those short, hefty women selling ice cream and goods while their babies sat in a papoose, on their backs. Talk about a different type of day care. That’s ten good reasons to visit Peru! (Especially the cow hearts!) Fabulous blog guys!